The Intramural Junior Referee Program is now OPEN on the Terryville Soccer Club website located at www.terryvillesoccer.com . Minimum age is 12 and max age is 19. If younger than 12 please contact me at intramuralregistration@terryvillesoccer.com as we have other positions with in the club. If you are a parent, the registration process is the same as if you were registering your child to register for the season. If you are a referee candidate and registering yourself, you must first create a login (if you don't already have one). The registrant's age must be accurate and fall between 12-19. Once logged in, click on "Register to Play/Participate" Select the Registrant and click Register Now. Register into the Program called 2019 SPRING INTRAMURAL REFEREES -> JUNIOR REFEREES. You will be asked a few registration questions. You MUST register to be considered. Registration for this program will be limited to 50 registrants, after that you will be placed onto a wait list. During the registration checkout process please read it carefully as you consent and print it for your child to read it. Pay rate has changed. 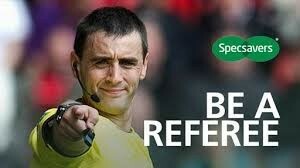 You will now be paid based on how long you have been a referee for the TSC, not on which age group you are refereeing. We will be utilizing some of our referees as Junior Trainers for certain age groups. During registration you will be asked if you are interested in being a Junior Trainer. If you answer yes, we will review and you may be asked to attend additional training sessions. Junior referees do not only referee games. They also carry out various administrative tasks to help the Intramural program run on Saturdays.